The smell is quite acidic and despite the many red fruits quite "bright" with plenty of wood influence. I like that. The "light" disappears in the mouth almost completely and makes room for ripe sherry influence, the upper aged suggests to Scottish scale. The finish is dominated by the oak. 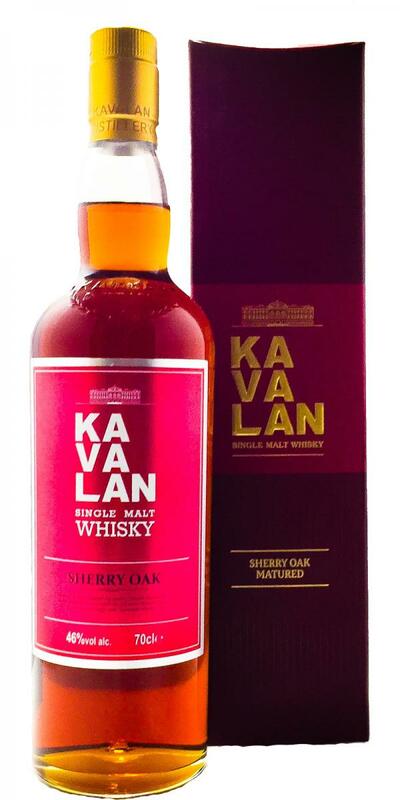 The people of Kavalan know what they are doing and they do it well. A very nice whisky. However, connoisseurs who have their problems with strong oak influence should refrain. The oak dominates with bitter influence, coffee, very dark chocolate, the fruity elements recede behind the oak. Fast additive maturation. Needs some time in the air to develop the great flavors in the nose. Less sweet and a little pear with water. 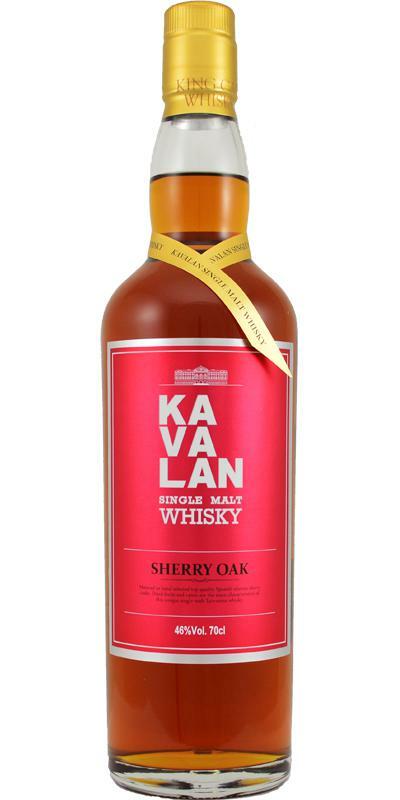 Kavalan soloist Sherry Cask is again a bit voluminous. The usual recipe for success. Full broadside of sherry paired with exotic spice and oak. I'm particularly partial to the nose here. Great example of cask spiciness. Slight nip of alcohol, then dark fruits – prunes and dates. Very savory – curry spice mixtures, with powdered ginger, cardamom, and coriander. In that it is rather close to some Solist single casks I’ve had. Herbal-spicy with huge dose of oak. Imagine an old attic that constantly is sun-lit. Quite dusty, saw dust in the air from somebody who was doing repairs in it recently. Always revolving back to the oriental curry-ness and even some liquefied licorice. Juicy oranges, immediately drying with oak spice and nutty flavors. Caramelized sugar, herbal tea – mint and aniseed. Minor maltiness paired with perfumy lavender. Medium. Brandy-infused raisins, sweet tannins, and fig chutney. Nose: Cassis, blackberries, raisins and orange peel. Wet tobacco, balsamico, chicken broth, slightly tangy and salty. Hints of menthol and cough drops. With time, earthy notes appear. Rotting leaves in autumn, mushrooms, damp forest floor. A great nose, no single off–note is to be found. I deliberately do not rate this whisky, which is something for lovers of solid oak, for the others is nothing. I have mixed feelings. He is not bad. He is not bad. However, the direction of the almost sprinkled sherry is on. Because I like the soloists of Kavalan somehow better. Of course they are extreme, but kick somehow more. I do not need another bottle of that. But there will be a soloist. Full pot of sherry. But not too cute. Blackcurrant jelly. Jostabeere. Cranberry. Then caramel. Some fig. Rumrosine. Rotten red grapes. Even spicier notes come. Soy sauce. Moist wine cellar. Tobacco. First some forest honey. Then again the red fruits. Now they are sweeter and more mature. In addition to the above, forest berries are also included. Then balsamic and cassis vinegar. Now the oak makes itself felt. A torrent of tannins spreads and it tingles a bit. The red fruits remain slightly. In addition leather and coffee. For the lover of sherry whisky a really good Allday Dram. Here you have done a lot of things right. Only the complexity, which one knows from longer matured Scots, is missing here of course. Water: three or four drops of water make it even sweeter - definitely try it! A nice sherry whisky without big corners and edges. He does not overwhelm anyone and is good to drink. But one notices clearly the too short additive maturation in the barrel. There is then missing somewhere but a bit the complexity, the longer matured Scottish sherry casks often bring with them. very sweet, very tasty, caramel and raisins. Alcohol for 46% astonishingly braked, then comes only with time. Long finish now stronger with alcohol, bitter oak, vanilla and coffee.